So writes Jim Dashiell ’68 in One Trail, Many Paths: Tales of Adventure on the Appalachian Trail, where he collects the stories of 15 AT thru-hikers. 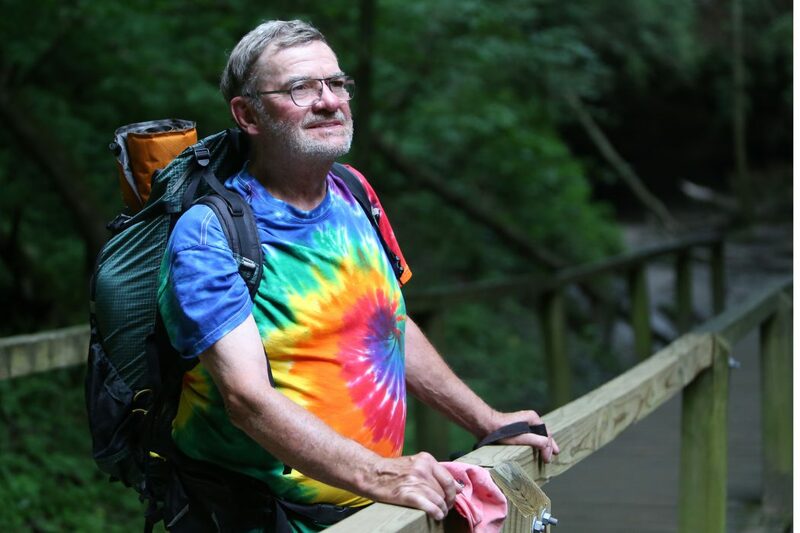 A retired orthopedic surgeon, he was 66 years old when he finished his thru-hike of the trail, losing 50 pounds in the process. Dashiell’s own story concludes the book. He calls it “clunky”—as cleanup writer he had to weave in context and facts the other writers had left out. Yet in this excerpt Dashiell captures the essence of the solitude and quiet that attract so many to the trail and that are often what hikers yearn for most after they finish the trail. Silence on the trail has many meanings. There are many kinds. There’s the hush before a storm. The birds become quiet, the wind stops, the forest seems to hold its breath. Then the distant rumbles of thunder begin and come closer as the wind picks up. The forest sounds an air of anticipation, an empty silence that precedes the coming roar. With the passing of the storm there is a sound of relief from the woods and joy it must feel in surviving once again this cycle of life. Then there is the silence that welcomes sunrise. The birds have announced the coming day, but they become quiet as the sunlight reaches the mountaintops, then the nearby trees, and finally the rocks and ground in front of me. There’s also the hush that says goodbye to the day as the sun escapes, dragging the light with it. It seems to be saying goodbye, but at the same time welcomes the night as we might welcome a good friend. There’s also the silence you feel when you are alone in the woods. A therapeutic stillness, a form of peace that moves you out of your self-consciousness and into the primal bond you have with the woods, with the moment. I miss the many hours I would spend alone every day. This is a simple quiet that heals and justifies you in a spiritual way. It feels cleansing. The trail is less about creating your identity than it is about finding it. Nobody can hike for months without learning more about themselves than they sought. This knowledge comes with the speed of rust. Hiking requires so very little mental capacity. You are so firmly in the present moment that the past and future seem closer. One day the same old questions have different answers. During a Wabash on My Mind podcast, Dashiell talked about his book’s authors and adventures, and why he decided to hike the AT. Listen at the top of the page. You can order the book at Amazon or find it in the Wabash Bookstore.